For the last ten weeks I have been working with Project Conservator, Emily Hick to conserve and rehouse a collection of rare Greek books. The weeks have gone racing by and now my internship has come to an end. 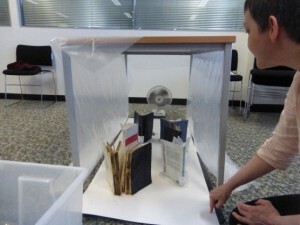 In light of this, I would like to share a bit more about my internship experience at the Centre for Research Collections. Working on the Blackie project with Emily has been a great way to gain insight into the planning and management of conservation projects. One of my responsibilities as intern was to record the time it took me to complete each task and the materials I used in the process. This was a really useful exercise as it made me think of how I could work more efficiently and be more resourceful with materials. I now feel that I am better equipped to plan and manage conservation projects myself in the future. One of the great advantages of working on a project involving Greek books is that I can’t stop and read them! However, I have occasionally found some quirky things in the collections to distract me. My favourite by far is this doodle on the endpaper of an eighteenth century book. 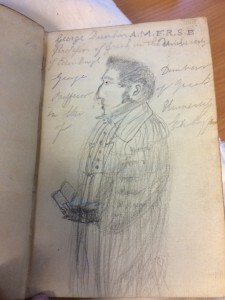 The image is of George Dunbar, professor of Greek at Edinburgh University from 1807 to 1851. It looks as if it may have been drawn by one of his students!? My background is in Preventive Conservation so the internship has been an excellent opportunity to become more familiar with paper conservation. I have been able to learn a lot more about the interventive treatments of paper just by observing Emily and the other conservators at work. As most cultural heritage collections contain paper objects and books, the value of this knowledge cannot be understated. 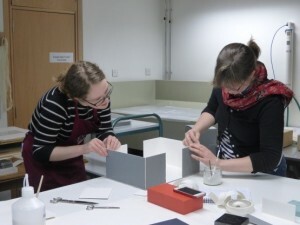 I thoroughly enjoyed having a go at some basic interventive conservation treatments during a Conservation Taster Day held at the CRC, where I learned to do tear repairs and infills on de-accessioned documents. As a Preventive Conservator, I feel it is important to have a broad understanding of all materials and objects found in cultural heritage collections. Therefore, it has been particularly helpful for me to visit different parts of the University’s collections to learn how they are cared for. I have been able to visit the Musical Instrument Collections, the Anatomy Museum and the Art Collections. 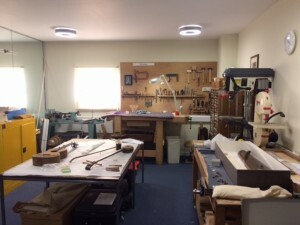 I was fascinated to learn about the treatments and techniques employed in the conservation of musical instruments. During my visit to the anatomy museum I was interested to learn about the practical ethical challenges in caring for collections of human remains. Throughout the internship I have had access to training, which has significantly improved my knowledge and skills in both preventive and remedial conservation. I have received training on rehousing, disaster planning and designing collections databases. The training will undoubtedly improve my chances of finding employment once the internship concludes. I have also been able to get an idea of what is involved in running a staff training day by assisting Emma Davey, Conservation Officer, in preparing for the disaster response and salvage training. 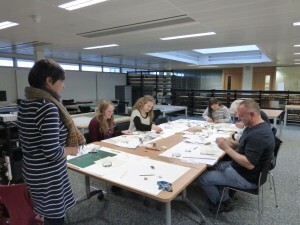 I have thoroughly enjoyed my time working with the Conservation Department at the CRC. I have been encouraged to get involved in all aspects of the Department’s work, from conservation and collections care, to public engagement activities. As a new graduate, the internship has allowed me to put the knowledge gained from my Masters degree into practice and given me more confidence in my abilities. The conservation team have all been very supportive and have given me lots great advice on career development. All in all, I think an internship with the CRC is an excellent opportunity for a new graduate, and I would strongly recommend it to anyone starting out in conservation. This entry was posted in Internships and tagged Centre for Research Collections, Conservation Internship, Greek Books, Preventative Conservation, University of Edinburgh by conservation. Bookmark the permalink.